Received a black eye from my dog on the way to the vet who now has $1000 of our money. Told I need a power of attorney to get a new ID card--only have medical power of attorney--if I leave base they won't let me back on again to even show them a power of attorney since my ID is expired! 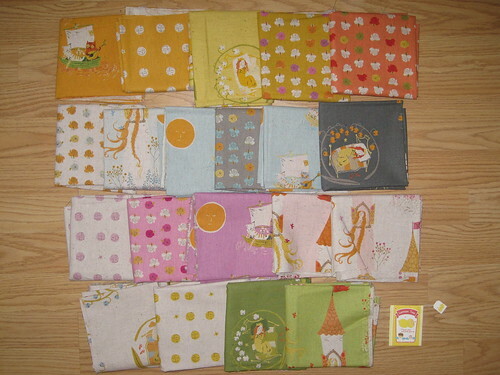 Paid a crazy amount of money on postage to send a swap package to the UK--who knew postage was that expensive?!?!? Signed up for another bee (bad, bad Amy!) It's a Christmas themed bee--I have no Christmas fabric! 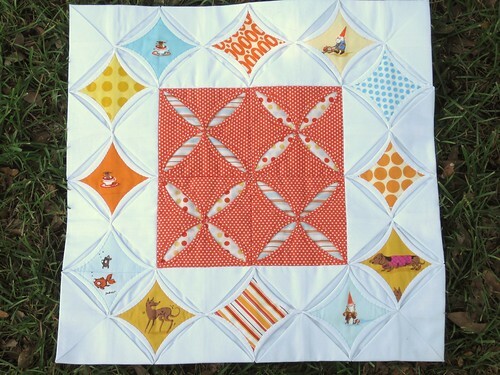 Received the most beautiful mini quilt ever in my Charming Mini swap (we send our partner the fabric we want a quilt made from and they come up with a design). Also got a terrific "thank-you" from Julie at jaybirdquilts. AND my good friend Sarah sent me two potholder and a dish towel just because she's awesome like that and I have really ugly potholders! Aren't my friends the best? My mom is in town--hooray for help! Hubby sent me a present (from Sephora!!!!!) and a card, just because. Isn't he sweet? Dragging my feet on my STUD mini quilt swap. I'm just not loving my mini, but I don't have time to start over. I hope my partner doesn't hate it! Oh! I still have black eye (a week later) courtesy of my dog. So, how was your last 7 days? Ouch!! I got a bad black eye from my dog last year. I learned that you don't ask a Rottweiler if she wants to go for a walk and then bend over to put your sneaker on. She just may be starting a leap of joy and will clock you in the face with her cement-block-like head. It sounds like you had a mixture of good and bad so I hope the good overwhelms you tomorrow! hey kelly...i have some christmas fabrics...what are you looking for? i did a swap last year of charms...so i have a variety...let me know! Oh, what a pain about the expired ID. I went through some form of that about 4 years ago and was in tears out in public of course. I'm not sure what's worse... kids not sleeping, or kids that will only sleep with you (rightnexttoyouwiththeirkneesinyourback). Let's hope it gets better for everyone!! I hope your next 7 days are better! sux about the id. but, i just read in your "about me" that you have a law degree collecting dust! yay for you. i wish mine were just collecting dust. that's my goal for someday! I'm glad to see your bullet points ended with some good things happening. Sounds like a trying week and it's got to be harder with your husband in Iraq. I hope the surgery was successful for your dog. Don't you just hate the military sometimes?!? I would call a supervisor, or your husbands first shirt. They can find a way to get your ID renewed. That is just dumb! I'm sorry about your doggy...and your eye and super sorry about the whole ID thing. Boy,have I been there! I have LOTS of Figgy Pudding Christmas fabric in larger cuts if you decide you'd like that and I have a charm pack of another Chritmas fabric by Moda if you are interested. Reading your post makes me thankful that I don't have to deal with the military any more! Glad they gave you a temp ID :)You can't do anything with out that thing!